Despite what dudebros might tell you on forums and social media, not everyone likes multiplayer games. Some people actually play Call of Duty, Battlefield, Halo, Gears of War, and others almost exclusively for the single-player campaigns. I’m one of those people. It’s not that I don’t like multiplayer deathmatch-type games, I just don’t like playing with jerks online, so I prefer playing the campaign or offline multi in splitscreen or with bots. So what am I doing reviewing Titanfall 2, the sequel to a multiplayer-only game? Because it has an actual amazing single-player campaign this time around that’s why! In fact, Titanfall 2’s campaign is one of the best shooter campaigns of the year, and that is saying something considering DooM, Gears 4, and Infinite Warfare all had pretty great campaigns themselves in 2016. If you like multiplayer, Titanfall 2 obviously has you covered. And if you like single-player, Titanfall 2 is actually totally worth buying just for that. See all of the details here in our full review. Titanfall 2’s story is kind of a mess because the first game’s story was a mess told through voiceovers during multiplayer matches in its fake campaign mode, but you don’t really need to know the details to get the gist of it. You play as a lowly ground soldier who is given a field promotion to Titan (giant robot) pilot when the Titan’s previous pilot dies. You and your new Titan buddy then carry out the deceased pilot’s mission and along the way discover a crazy new weapon the bad guys are planning on using against the Militia (your team). What makes it all work is that your Titan actually has a personality and a real bond forms between not just the in-game pilot and Titan, but with you as well. 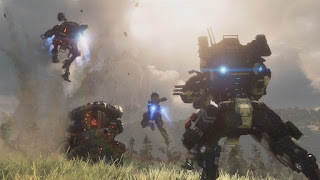 Titanfall’s greatest strengths have always been the Titans themselves as well as the freedom of movement you have while running around outside of the Titan on foot, and the campaign in Titanfall 2 delivers hot steaming servings of both. While on foot you can double jump, wall run, and more and the controls feel absolutely amazing. There are a few platforming sections in the campaign that are stunningly fun because they seem impossible yet you can fly through the air and kick off walls and change direction and do all sorts of crazy stuff with ease. I can also happily say that Titanfall 2 actually takes the kid gloves off and lets you just play and have fun in the campaign. You aren’t following an A.I. around and doing what they tell you when they tell you like in Call of Duty. Instead the campaign battles play out more like a Halo game where you can approach situations in a million different ways and from any angle and actually make your own fun. There are also a couple of really, really innovative sections during the campaign that I won’t spoil, but they’ll leave your mouth agape and you will say WOW. A lot of the campaign is spent outside of your Titan on foot, but you do still spend some meaty chunks of time piloting the big guy as well. These Titan sections usually pit you against enemy Titan robots and are some of the most intense and fun sections of the game. While you’re light and nimble as a pilot, your Titan is hulking and slow and more methodical, which gives the gameplay a nice variety and change of pace. Fighting enemy Titans is also a lot more difficult than fighting regular soldiers, too, so the Titan fights are much more strategic and thoughtful than you’d expect. There are even some boss fights against more powerful Titans that are some of the best giant robot battles we’ve played in years. Put all of this together and you have a pretty great campaign that, like I said, is among the best I’ve played all year. The level designs are great, the gameplay is fantastic both on foot and in your Titan, and there are some genuinely innovative and fresh and new things going on that you won’t expect. We always knew Titanfall would be a great single-player game, and I’m happy to say we were right. What about the multiplayer side of things? Well, it’s largely the same as Titanfall 1, but with some slight changes. Titans now have a system of batteries you scavenge from the battlefield to recharge their “health”, which is kind of a neat idea. When a pilot “rodeos” a Titan (as in jumps on top) it is no longer a one-hit KO like in the first game and instead they just steal a battery which can then be given to a teammate or put in their own Titan. Beyond that, Titanfall 2 offers mostly the same multiplayer modes and overall experience as the first game, though it is on a collection of all new maps. Having exclusively new maps, along with totally new Titan classes, has sort of turned off fans of the first game hoping their favorite maps or Titans would return, but I don’t mind it. New stuff is good. One feature that is not present in Titanfall 2’s multiplayer is an offline mode against bots. 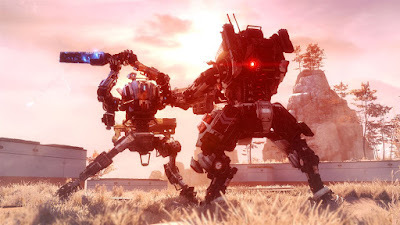 Considering Gears 4 and Infinite Warfare (and Modern Warfare Remastered) all had offline modes with bots, I have to knock Titanfall 2 down a peg. It is a great game, but not as feature complete as the competition. 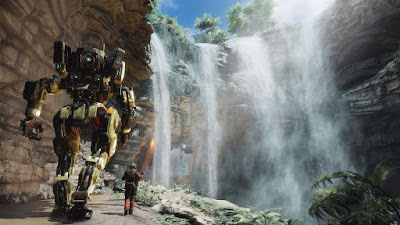 The presentation in Titanfall 1 was a bit of a sore spot because it didn’t exactly look like a fancy new generation shooter like it was marketed as. It just looked OK. Thankfully, Titanfall 2 has much more polished and detailed visuals and looks much better overall. It runs at a silky smooth 60FPS at all times, even with tons of soldiers and Titans running around. The sound is likewise very good with solid voice acting, good music, and great combat sound effects. In the end, Titanfall 2 is a great sequel that actually lives up to the hype and promises and potential that the first game fell short of. The multiplayer component is solid as you’d expect, but it is in the stunningly good single-player campaign that Titanfall 2 impresses the most. At the full $60 MSRP I might not suggest buying Titanfall 2 just for the solo experience, but the price has been rapidly fluctuating since launch (I got my copy for $35 less than 2 weeks after launch …), so if you find it for cheaper, buy it. Folks that plan to play both solo and multiplayer can spend a little more. Either way, I highly recommend Titanfall 2 as one of the best shooters of 2016.